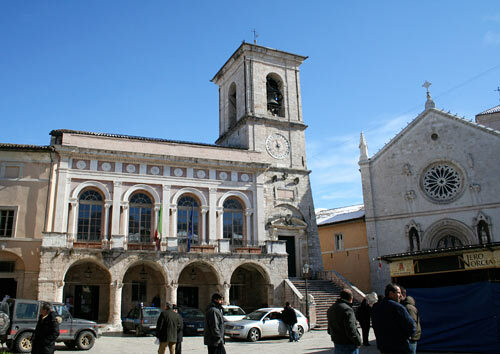 Norcia sits at the foot of Monti Sibillini and has been a trading city and staging post for centuries. It is famous for being both the birthplace of St. Benedict, founder of Christianity’s first monastic order, as well as being one of Italy’s great culinary capitals. Today, Norcia is best known for its local produce, in particular black truffles and top quality meat, sausages, and salami. The city is just a 90 minute drive from Perugia and is well worth a day trip for those interested in traditional Umbrian cuisine. The word “norcino” from the town’s name is now synonymous with superior meat products. How to get to Norcia – Norcia can be reached by bus from Spoleto, Terni, Perugia, Foligno and Assisi. If arriving by car, follow the E45 towards Assisi and Cesena, taking the exit towards Assisi/Foligno and merge onto the SS75. From there, choose Foligno Est exit merging onto SS3 and then follow the the road to Cascia/Norcia. What To See In Norcia – Norcia is a small city surrounded by thick walls built in the 13th century and glimpses of the impressive Sibilini mountains can be seen throughout. Apart from the many wonderful food shops and salumerie, most of the historical sights worth visiting can be found clustered around the main square, Piazza San Benedetto. A statue of St. Benedict by Giuseppe Pinzi sits in the center of the square. Although the existing basilica, Church of San Benedetto, dates back to 1389, it was rebuilt after suffering damage from two earthquakes in the 17th and 18th centuries and is said to be built over the birthplace of the saint and his twin sister. The right side of the church is flanked by the Loggia dei Mercanti (or Portico delle Misure), built originally in 1570 and rebuilt after the 1859 earthquake. The interior of the basilica was also altered in the 18th century. Under the Balcone dei Cantori, a 16th century fresco survives of the “Madonna With Child, St Barbara and the Archangel Michael”. Above the second altar to the left there is the “Resurrection of Lazarus” by Michelangelo Carducci (1560, from Norcia), while the altar of the left hand transept is surmounted by “St Benedict and Totila”, by Filippo Napoletano (1621). Two lateral stairways lead down to the crypt, escavated in 1910 which, as demonstrated by the opus reticulatum of the walls, was built partly covering a 1st century Roman public building. A section of the house where St Benedict and his twin sister St Scolastica were born is believed to have been used for the chapel in the left hand nave. A series of frescoes depict Jesus and the birth of the two saints. The outside portico of Palazzo Communale is original, but the bell tower dates back to the 18th century and the building has been beautifully restored. A contemporary stairway leads up to it. A 1450 reliquary is kept in the chapel of the palazzo. Across from the church sits the Castellina, a fortress built in 1554 for Pope Julius III that was designed by Jacopo Barozzi. The first floor houses the Museo Civico, which contains works from Norcia and its surrounding area between the 13th and 18th century. Amongst the artists represented there are Giovanni della Robbia, Nicola da Siena and Antonio da Faenza. There is also a particularly fine wooden sculpture of the “Deposition”, from the 13th century, and an altar piece by Jacopo Siculo. The Cathedral of Santa Maria Argentea, or Duomo, sits next to the Castellina was built in 1560 and bears the scars of repeated restorations due to damage caused by earthquakes over the centuries. The Duomo does host the Capella della Madonna della Misericordia which is located at the end of the north aisle and consists of an ornate alter made of inlaid marble. On the way to the Capolaterra area of town, which being the highest point suffered worst the damages wreaked by the 1979 earthquake, stands the Palazzo dei Cavalieri di Malta. The Gothic Church of St Augustine is a little further on. Its façade is decorated with a 1368 fresco. Remodelled in the 17th century, the interior does still contain some interesting 14th and 15th century frescoes completed by local artists. Almost at the top of Capolaterra stands a building that appears insignificant from the outside but whose interior is much more interesting. It is the Oratory of St Agostinuccio. The inlaid, gilded and painted wooden ceiling is a masterpiece of local 16th century craftsmanship. The stalls and statues of the patron saints are also particularly well crafted. In Via Umberto I stands the Tempietto, or Edicola, built in 1354 and is one of the town’s more interesting buildings. Square in design, it stands 6 metres high and contains two entrance archways that are decorated with bas-reliefs and is open to the street on all sides. The nearby Church of St John, is one of the oldest churches in Norcia that was restructured in the 18th century and is known for its wooden ceiling and finely decorated and carved altar from 1469. The altar frames the miraculous image of the “Madonna della Palla”, by Giovanni Duknovic known as Il Dalmata.